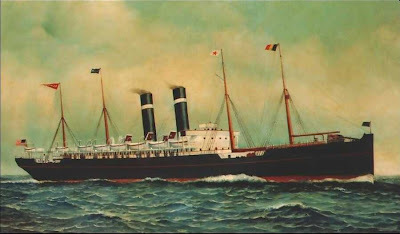 If you read Ferencz Ujlaki and the trip he didn't take: Part 1 you know that I had some work to do in order to solve the mystery of my great-grandfather's appearance on the passenger list for the ship S.S. Kroonland which departed Antwerp on April 2, 1906. Listed but noted as "not on board", was he on the ship, but logged somewhere else, or did he postpone his trip and take another vessel? I had originally thought that another ship's passenger list may have had my Ferencz Ujlaki listed (the S.S. Ultonia which departed from Fiume on April 12, 1906), although it wasn't clear if this was the right man. Just last week fellow genealogist Jennifer Trahan had kindly done a search for me and found Ferencz listed on the S.S. Kroonland. This left me with a mystery since he was clearly marked as "not on board". Now, with a find from another fellow genealogist, Donna Pointkouski, I have one more passenger list to evaluate with Ferencz Ujlaki's name on it - and this appears to be the very ship on which he sailed to America. The S.S. Zeeland departed Antwerp on April 7: five days after the S.S. Kroonland. Same port, five days later. It looks very possible from examining the facts that this is the trip that Ferencz Ujlaki actually took. It is probable that he changed plans for some reason, got off of the S.S. Kroonland, then took the trip five days later out of the same port on one of the S.S. Kroonland's sister ships: the S.S. Zeeland. At this point I can only wonder about his reasons, but the progression of events makes sense. The S.S. Kroonland indicates that Ferencz had $13 in hand; the S.S. Zeeland (five days later) appears to indicate $5.70 in his possession (although this is not completely clear). If this is true, it makes sense. He had to have spent a little money in those few days that he waited to board the second ship. The facts validate that the men on both passenger lists must have been my great-grandfather, leaving his native village of Legrad to begin a new life in America before his wife and soon-to-be-born baby were to join him there. Another family history mystery appears to be partially solved, thanks to a little help from some friends. This article was originally published here at 100 Years in America on February 8, 2009. 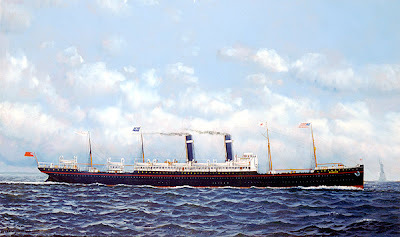 I have republished the story of my great-grandfather's passenger list in honor of the new Red Star Line Museum which is currently scheduled to open in Antwerp, Belgium next year. 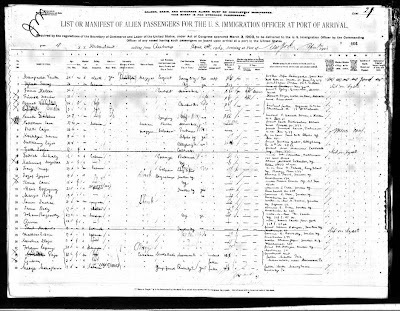 Manifest, S.S. Kroonland, April 1906, microfilm roll T715_690, page 101, line 2, Ferencz Ujlaki, age 26; “Passenger Record,” digital images, Statue of Liberty – Ellis Island Foundation (http://www.ellisisland.org/EIFile/popup_weif_5a.asp?src=%2Fcgi-bin%2Ftif2gif.exe%3FT%3D%5C%5C%5C%5C192.168.4.227%5C%5CIMAGES%5C%5CT715-0690%5C%5CT715-06900492.TIF%26S%3D.5&pID=103485080152&name=Ferenz+Ujladi%26nbsp%3Bnull&doa=Apr+12%2C+1906&port=Antwerp&line=0002 : accessed 4 February 2009). Manifest, S.S. Kroonland, April 1906, microfilm roll T715_690, line 2, Ferencz Ujlaki, age 26; "New York Passenger Lists, 1820-1957," database, Ancestry.com (http://content.ancestrylibrary.com/iexec/default.aspx?htx=View&r=5542&dbid=7488&iid=NYT715_690-0494&fn=Ferenz&ln=Ujlaki&st=r&ssrc=&pid=4010022460 : accessed 8 February 2009). Original data from: "Passenger Lists of Vessels Arriving at New York, New York, 1820-1897"; (National Archives Microfilm Publication M237, 675 rolls); Records of the U.S. Customs Service, Record Group 36; National Archives, Washington, D.C.
S.S. Kroonland painting; digital image, S. S. Kroonland website (http://www.rehsgalleries.com/view_image.html?image_no=503& : accessed 8 February 2009. Manifest, S.S. Ultonia, April 1906, page 580, line 21, Ferencz Ujlaki, age 29; “Passenger Record,” digital images, Statue of Liberty – Ellis Island Foundation (http://www.ellisisland.org/EIFile/popup_weif_5a.asp?src=%2Fcgi-bin%2Ftif2gif.exe%3FT%3D%5C%5C%5C%5C192.168.4.227%5C%5CIMAGES%5C%5CT715-0702%5C%5CT715-07020580.TIF%26S%3D.5&pID=102220070111&name=Ferencz%26nbsp%3BUjhazi&doa=May+02%2C+1906&port=Fiume&line=0021 : accessed 15 July 2007). Manifest, S.S. Zeeland, April 1906, page 334, line 29, Uzlaki Faranz, age 27; "Passenger Record," digital images, Statue of Liberty - Ellis Island Foundation (http://www.ellisisland.org/EIFile/popup_weif_5a.asp?src=%2Fcgi-bin%2Ftif2gif.exe%3FT%3D%5C%5C%5C%5C192.168.4.227%5C%5CIMAGES%5C%5CT715-0694%5C%5CT715-06940334.TIF%26S%3D.5&pID=102212100342&name=Uzlaki%26nbsp%3BFaranz&doa=Apr+19%2C+1906&port=Antwerp&line=0029 : accessed 5 February 2009). S.S. Zeeland oil painting by artist Antonio Nicolo Gasparo Jacobsen, ca. 1910; digital image, Rehs Galleries website (http://www.rehsgalleries.com/view_image.html?image_no=503& : accessed 8 February 2009). 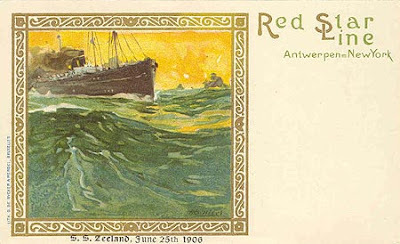 Red Star Line S.S. Zeeland postcard, June 25, 1906; digital image, Red Star Line website by Ian Boyle/Simplon Postcards (http://www.simplonpc.co.uk/RedStar.html : 8 February 2009). 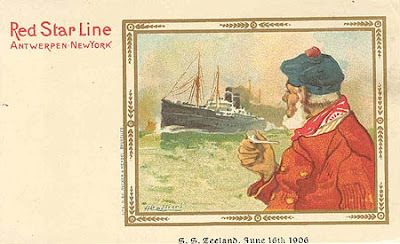 Red Star Line S.S. Zeeland postcard, June 16, 1906; digital image, Red Star Line website by Ian Boyle/Simplon Postcards (http://www.simplonpc.co.uk/RedStar.html : 8 February 2009). What an interesting story! Excellent research, too! I see according to Geneabloggers it's your five year anniversary since you've been blogging. Happy Blogiversary.